The world has undergone drastic changes over the last few decades. The essence of our time is the transition from the modern society of the Industrial Age to the post-modern (post-industrial) society of the Information Age. What we are witnessing today is another phase transition – a unique era in the history of mankind characterized by a paramount economic, social and political earthquake before a revolutionary leap onto a new technological level. With the advent of the information society, the concepts of security and warfare are being reshaped to account for the challenge of information wars, a new phenomenon of the post-modern society. With the growing impact of information on national security any state needs to develop a series of adequate approaches and structures to face the challenges of information attacks and confrontations. The previous post has tackled this question from the EU’s perspective, in particular with regards to its recent initiatives such as the EU Cyber Security Strategy and the Horizon 2020 Program. None the less interesting is that, as demonstrated by the ongoing Ukrainian-Russian conflict, resistance to external threats, including information resistance, can be mounted and maintained on the civil level too. The case of Ukraine demonstrates that self-organized communities of local people, united via social networks on the principles of solidarity and mutual help, can add an effective leverage to the traditional diplomatic and military means, or even replace them. The three cases in point below exemplify this statement. The information war against Ukraine, with its extreme form unleashed by Russia following the Euromaidan, has exposed the fact that the world is still created by TV news and press, even though the Internet and social networks are becoming more and more important. In this regard, how is something said is more important than what is said, with made-up stories creating real motivations that may lead to a radical change of reality. The concept of the information war thus entails that the virtual reality affects and even replaces actual reality. On the one hand, the influence of Internet in Ukraine is still not strong enough to compete with the Russian TV-produced agitprop that can be briefly summarized as: 1) the positive portraying of Russia and its political elites; 2) the alleged encirclement of Russia by the enemies (the US, the EU, the Baltic States, Georgia, Ukraine), with the government fighting them to revive the Russian empire; 3) the Russian empire as an idea of global justice for all. On the other hand, sense-making in in the Internet is much more dynamic and powerful, a factor that can also account for the victory of the Ukrainian Maidan. In this regard, for many Ukrainians, the current social networks have replaced mass media and become the primary source of information, as well as a place for discussion, polemics, analyses of the events and forecasts. It is worth mentioning here that the intensity of information influence onto the consciousness of individuals and the public is often higher in social networks compared to the traditional mass media. Firstly, social networks provide information at large volumes and with promptness. Secondly, data reliability and authenticity can be easily verified. Finally, the information can be easily and quickly documented via graphic, audio and video content. To sum up, the problematique of the Ukrainian-Russian relationship does not come down exclusively to the political steps of the governments of both countries and the real or potential military activities. It also engages via social networks and Internet television the wider population on both sides and influences the public opinion. Since February 2014, thousands of Ukrainians have finished their working days by visiting the “Info Resist” Facebook page. Each night, Dmitry Tymchuk posts a summary message in several languages, based on the group’s own intelligence data, about the state of the Armed Forces and Special Services of Ukraine, and the situation in the country’s turbulent south-east. Infact, the “InfoResist” tookonthefunctions of the state structures that were supposed to inform the Ukrainian people and the world community about the latest developments. Another great example of the informational confrontation on the civil level is the StopFake.org project[viii], launched on the 2nd of March, 2014 by the students and graduates of the Digital Future of Journalism program at the Mohyla School of Journalism in Kiev, Ukraine. While the “Info Resist” group mentioned above seeks to provide first-hand objective data, the StopFake.org team acts as a “count misinformation team” by debunking the erroneous information that has been spreading over the Internet since Ukraine’s crisis in Crimea. “The reason we are doing is very simple – aggression against Ukraine is unfolding, and it’s not only military aggression but very powerful information warfare. And Ukraine was losing it,” said Yevehn Fedchenko, director of the Mohyla School of Journalism in Kiev. [ix] Since its initial launch by the six students, the project has attracted dozens of new volunteers, including editors, proof-readers, translators, and programmers. StopFake.org provides an opportunity for anyone to submit a debunked story. The site operates in two languages, and also releases weekly digest reports via its YouTube channel. As stated in its mission, the community does not represent or support any political party or other organization, and anyone can join and provide moral and intellectual support. The ultimate goal of the project is to maintain Ukraine as an independent and sovereign state. All in all, this is another example of a combined civil effort, constructed on sheer patriotism and enthusiasm, aiming to provide rapid, objective and credible information. In fact, this is a continuation of the approach adopted during Maidan, when people organized themselves without any external coordination. 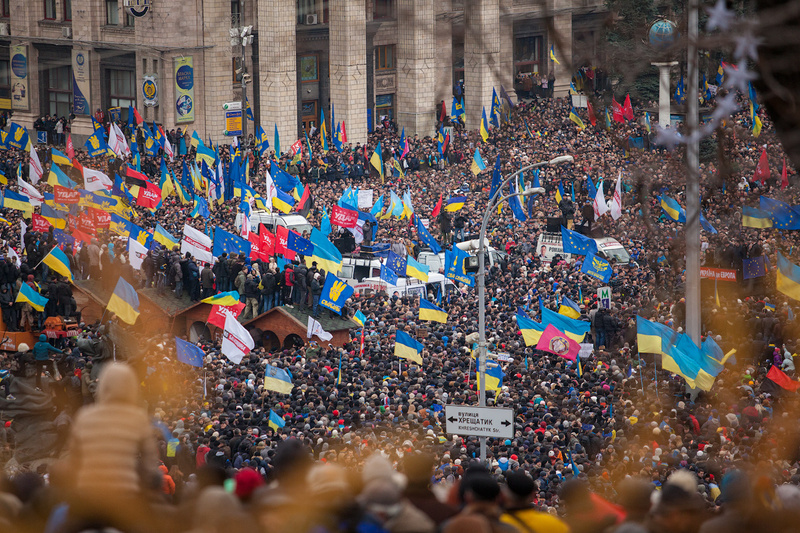 Today Ukraine is fighting an information war largely by efforts of public activists. The Ukrainian Maidan, as well as the conflict with Russia that followed, have demonstrated the power of social networks in a civil protest. A network is the most effective communications system that can compete effectively with both the state and corporate media. By “social network” here we need to understand also any physical Internet networks like Facebook or Twitter that help disclose the truth despite numerous manipulations in mass media. This is as well a network of citizens that provide mutual trust, respect and cooperation. Yet, most importantly, this is a principle of self-organization of the previously “territorial” local communities. Applied to Ukraine, these communities managed to organize themselves into trusted connections and stand up against the system of criminal corporatocracy (as this was at Maidan), and against the neo-imperial polities (as this is in the conflict with Russia). The latest political events in Ukraine show that the network principle increases dramatically the capacity for survival in the conflicts between nation-states and corporation-states, and between nation-state and empires. Nothing can suppress an entity that can quickly and efficiently re-appear in any other place. Geography is no longer important for the networks of mutual supportiveness and donation. No criminal, oligarch or imperial system can exist for a long time against the people’s morale transformed into network communities. Perhaps what is happening in Ukraine today is the beginning of the alternative brave new world. And this is where the big lies come out – the lies of the Russian political elites to their people about the possibility of reviving the empire. After all, the Russian elites cannot but know that nation-states are fading away all over the world, that they are being replaced with corporations (“corporation-states”), and that our future lies with self-organized network communities that form the only vector of resistance against such developments. This entry was posted on 02/05/2014 by ISIS Europe in Opinions and tagged community action in Ukraine, crimea, eu-ukraine, euromaidan, information war, mass media in ukraine, social network in Ukraine, stopfake.org, ukraine-russia, ukraine-russia military.